Christopher Priest's Rebirth Deathstroke Vol. 2: The Gospel of Slade builds well on the volume that preceded it. With this book, Priest further demonstrates his intention to tell this story in his own way and at its own pace; Gospel actually includes the final chapter of the "Professional" story from the previous book plus the two-part "Professional" epilogue and concludes with a one-off issue set outside the book's main timeline. This makes "Professional," with prologue and epilogue, a nine-part story that bobbed and weaved rather significantly, bucking the six-issue "trade and done" trend — and in all of that, Priest has only moved Deathstroke's present action by inches. All of this conveys a literary sensibility and a willingness to "go weird" as the title calls for it, a hallmark of some of the best series, and I'm certainly interested in what Priest is going to do as Deathstroke ramps up for its first crossover. Gospel mitigates a few of Deathstroke Vol. 1: The Professional problems, such that there might have been some value in collecting "Professional" all together despite the logistical problems (and it's a pity Priest's Deathstroke isn't getting combo Rebirth deluxe volumes). What seemed flightiness on Slade Wilson's part, dragging daughter Rose to Gotham in pursuit of some imaginary enemy, becomes more cogent once we understand Slade recognized the assassin, Rose's boyfriend, on first sight, and then essentially deposited her into Batman's care while Slade took out the boyfriend himself. Early in Professional, Slade seemed perhaps too emotionally motivated; Gospel reveals much of that to be feint, borne also from the fact that Slade recognized the handiwork of his ex-wife, Adeline Kane, long before Priest let the reader know that he did. Adeline's inclusion here is interesting for long-time Deathstroke fans, as is moreover Vigilante Pat Trayce, and for Priest fans, Dr. Arthur Villain -- the latter two who haven't had major appearances since the mid-1990s. Trayce is a significant deep dive into Deathstroke lore, one of the most startling instances of pre-Flashpoint continuity returning that I've encountered so far, and Priest's entire conception of this storyline is brilliant, with even Rose's would-be assassin Luis having come from the Deathstroke mythos. Having Dr. Villain back is just fun, reminding us most of all how overdue we are for a collection of Priest and Denys Cowan's Steel run, which could maybe happen in just one big book (if Priest manages to get Boris in here, I will squee). Though ostensibly Adeline attacked Slade and his compatriots to try to influence Slade to join her mysterious cause, underlying this is the idea that Adeline blames Slade for choosing his illegitimate daughter over his son Joey "Jericho" Wilson, leading to Joey's injuries. There's a partial difficulty, however, in that you either have to really believe Adeline is insane (which she has been, continuities ago) or else flub the timeline a bit. Rose was, Priest has established, about ten when Joey was hurt, and if we'd like to believe Rose is about eighteen now to be working as a bouncer in a club, then that gives Adeline almost eight years to still be taking revenge on Slade, even after she shot out his eye and Joey lived and became a functioning member of society. That's a long time, perhaps stretching believability, for Adeline to be this angry without something else going on. We don't yet know if Joey was a Titan, but at the least Superman seems to know him and calls him "Jericho," so he apparently has some superheroic background. Nor do we know how Joey got from having been a pupil of Ra's al Ghul one title (and possibly a continuity) ago to vice president of a company, but surely Priest knows this and will address it in time. I'm not much a fan that Joey can essentially talk now, this being a significant departure from his classic depiction, but I find it more problematic that by the end of his first appearance he seems to be a murderer. Jericho's co-creator Marv Wolfman is just as responsible for "crazed Jericho" as anyone (so a touch of evil is baked into the source material), but Joey has been so bad for so long -- and often tediously -- that I was hoping Priest might right the ship (I still hold out the possibility that there's more going on with Joey since we didn't see the body of the man he supposedly killed). 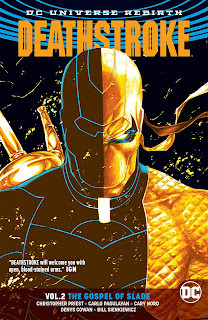 Within the two-part "Four Rooms," Priest offers our most specific look so far at Deathstroke's origins, including that "Deathstroke" was the name of his sword (kind of like "Indy" is the name of the dog). I'm not sure these kinds of origins -- hooking up with Wintergreen while hunting a military despot -- can ever quite live up to what one might imagine, though I did appreciate an emerging theme in Priest's series. Here, Slade seems to be trying to capture General Dragas for the money, but as Wintergreen notes, Slade perhaps wanted Dragas to stand trial; equally we see Slade rescuing foreign leader Red Lion (after double-crossing him) perhaps to prevent further bloodshed overseas. The fact that Priest has restored Slade's relationships with Batman and Superman has also brought up a few times why these heroes don't simply arrest Deathstroke, and the answer seems to be that everyone recognizes Slade as a force for some kind of good, even if there's often the plausible appearance that he's doing something bad. This puts (or re-puts) Slade in an interesting place in the DC Universe, far more interesting than the simple assassin-for-hire that Slade had been portrayed as in the New 52. Gospel concludes with Priest's "Chicago," a missive about gun violence in America. Aside from being a moving story, most notably "Chicago" reunites Priest with Steel artist Cowan and also features Bill Sienkiewicz. In content, Priest does as well as he can addressing a problem with no clear answers; as is appropriate for the title, Priest leans in to the gritty, Deathstroke-eseque "everyone is to blame," and to that extent I might still favor over this Scott Snyder's similar Batman #44, "A Simple Case" -- which offered instead that we might care about one another better -- but to be sure it's not a contest. What's otherwise exceptional about "Chicago" is that Priest has the wherewithal to tell a Deathstroke story that very hardly includes Deathstroke, and also that absents itself entirely from the book's general timeline, simply because it's a possible and opportune thing to do. This creates a kind of universe or ethos for the title that only very special books achieve, and it only increases my esteem for this title. After Deathstroke Vol. 2: The Gospel of Slade, there's only one book to go before Deathstroke re-meets the Titans in Lazarus Contract. Looking ahead from where the book is right now, I have absolutely no idea how Christopher Priest is going to logically bring Power Girl Tanya Spears into this title, but simply the fact that Priest thinks to use Spears -- after Pat Trayce, after Arthur Villain -- again signifies that Deathstroke is working on another level against the fabric of the DC Universe. The second volume trends this series up.